Click on AT&S and then on Add. Select the type of assessment that you plan to design: Assignment, Test, or Survey. If you are adding an ‘Assignment,’ it is very likely that you will add only one question (i.e. a short answer or essay question). However, if you are creating a quiz or a survey, you will probably author many questions. You may author questions on-the-fly when adding assignments, tests or surveys by clicking on Add (and Add Another). When you author new questions from the Assessments view, AT&S creates a pool automatically for you and places the questions there, as well. The pool becomes a master copy of your questions that you can reuse to create new assessments, as desired, without affecting a published assessment. The title of the auto-pool is the same as the title of your assessment so that you can find it easily in your pools. This is another way to build question pools. When you click on “Add” to author a new question in your assessments, depending on what assessment you are working with, AT&S will present you with default choices that hopefully will make your workflow more efficient. If you are authoring a test, upon Add, the default question type presented is multiple-choice. If you are authoring an assignment, upon Add, the default question type presented is ‘essay’. 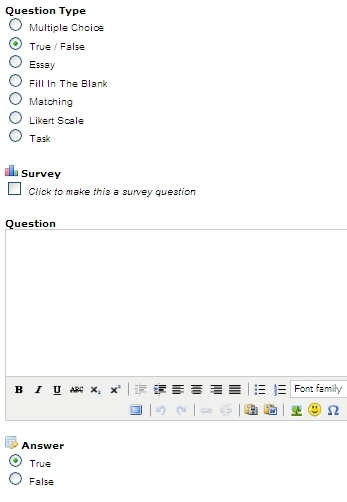 If you are authoring a survey, upon Add, the default question type presented is ‘likert-scale’. Upon clicking “Add another” question, AT&S knows what you authored just prior to it, and will present you with the same question type. When you click on Add a question, the second half of the screen is populated with the fields for you to author the question and add it to your assessment (and automatically to a pool). You may change a question type at any time (see radio buttons in the above screen shot). Be careful when changing a question type as you will lose details from components of an authored question if the new question type does not have the same components (i.e. when changing a multiple-choice question to essay, the feedback, hints will be preserved but the ‘choices’ will be lost, as essay questions don’t have choice. Once you add questions and click on Done, they are added in the order authored in the main Edit Assessments view. You can preview a question by clicking on the ‘view’ icon to the right of the question. To make modifications to questions, just click on the question itself. Notice that questions are hot links. The changes that you make to questions will propagate automatically to the pools they belong to, and in all other assessments where the questions are used – if and only if the assessment is not yet published. If your assessment is published, then any corrections you make to its questions, point value, answer key, etc. will not propagate to the pool or other published assessments where the questions may be used. If you find errors in published assessments and fix them, please make the corrections in all instances of the questions used in your course (pools and other assessments). Preview your assessments closely and test-drive them prior to publishing them. Changes to questions can be made, but it is always best to not make changes to assessments after some students may have access them.